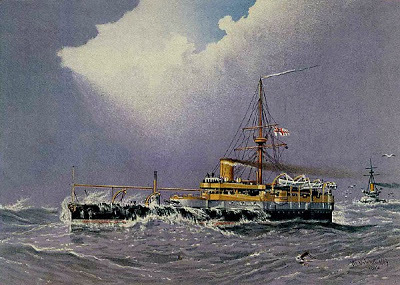 HMS Hero and her sister, HMS Conqueror, both commissioned in the late 1880s, were described by Dr.Oscar Parkes, the ultimate authority on British battleships, as “two of the most useless turret ships ever built for the Navy”. Despite this damning evaluation, which was supported by many officers during her lifetime, HMS Hero was to achieve a bizarre degree of fame for over another century. The reason for this had little to do with the unfortunate vessel herself and depended on her being named on the cap-band of the seaman featured in the logo of Player’s Navy Cut cigarettes. 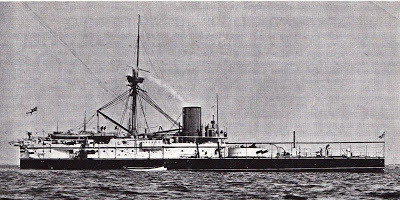 In late Victorian uniform, the sailor’s head and torso were seen though a life-belt, with two poorly-defined ironclads in the background, that on the right possibly HMS Hero herself. 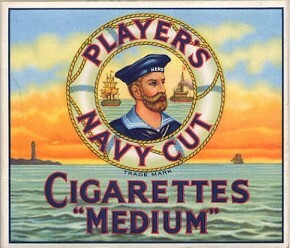 The cigarettes were launched by the tobacco company John Player Ltd. in the same period as the ship herself. These were years in which there public pride and interest in the Navy was growing – and would continue to do so up the Great War – as evidenced by the popularity of HMS Pinafore and of sailor suits for children. 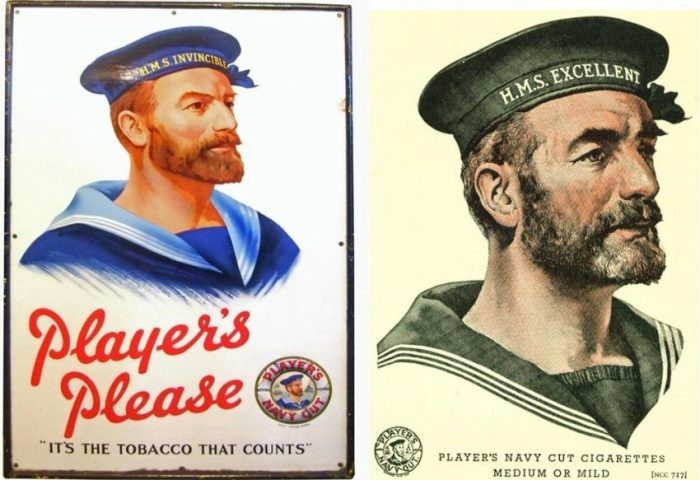 In the early years the sailor in the logo was apparently sometimes bearded, sometimes clean-shaven, but the bearded version seems to have been standardised in 1907 and has continued up to our own day. The name “Navy Cut” originated from a sailors’ practice of binding a mixture of tobacco leaves and leaving them to mature under pressure. A slice of this slab came to be known as a “cut”. Commercially successful and widely recognised as the cigarette brand was, the ship associated with it was to have a much less stellar career. Both Hero and her sister Conqueror were designed in a period of transition, when there were conflicting views on how line-battleships should be armed and armoured. Large calibre breech-loading rifles were coming into their own, breakthroughs in metallurgy were providing much more effective armour, and compound steam engines were promising greater power and fuel-efficacy. Smaller-calibre quick-firing guns, up to 6”, were proving their potential and there was intense debate as to whether the ram was still a viable weapon in action. Allied to this was the question of tactics – no fleet action had been fought with such ships and theories abounded as to how to employ them. The problem was not the availability of technology but rather how disparate available elements were to be integrated into a single concept which would function efficiently in line with an agreed tactical doctrine. The controversies of the 1880s were to be resolved in the next decade with the appearance of the Royal Sovereign class which was to set the line of evolution that almost all battleships would thereafter follow, not only in Britain but elsewhere as well. Getting to this point however involved pursuing number of technical and tactical dead ends, the most notable being perhaps HMS Hero and HMS Conqueror. Their basic design premise was that they would combine large calibre guns (two 12”) in a single rotating turret, strength enough for ramming, a substantial secondary armament (four 6” quick-firers), six above-water 14” torpedo tubes, a plethora of small-calibre weapons, heavy armour and, for good measure, a small torpedo-boat carried on deck which could be lowered to launch its own separate attacks. Happily this poor seakeeping capability was recognised by the navy and except for manoeuvres (always in sight of land) these expensive ships were relegated to duties that kept them in port. Conqueror became the tender to the gunnery training school Cambridge at Devonport in 1889, two years after launch, and was paid off in 1902. Hero led a similar existence at the gunnery school Excellent at Portsmouth, ending up as a target ship and sunk on the Kentish Knock in 1908. 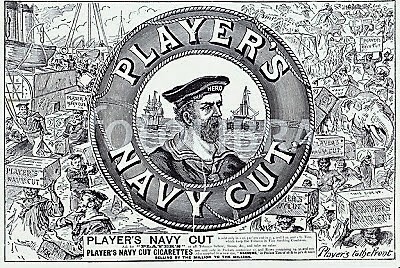 Despite their humdrum lives both ships looked magnificent in Victorian livery and Hero was to gain immortality of a sort on the Player’s Navy Cut logo. It interesting to note that in the course of almost a century’s use of the sailor motif, the name on the cap does seem to have changed on occasion. Given the fact that HMS Hero ended us as a target ship for the HMS Excellent gunnery school, it is not surprising that at one stage the name on the seaman’s cap was changed to the latter. Another variation was HMS Invincible – perhaps honouring the first battle-cruiser which, when launched in 1907, represented the acme of naval modernity. One suspects that this name might have been dropped following the tragic loss of Invincible at Jutland in 1916. And an afterthought – given that all ships are female, should this misconceived vessel have been named HMS Heroine? The answer is perhaps that the name “Hero” referred to the female protagonist in the Greek myth about the star-crossed lovers, Hero and Leander. Given that there was a HMS Leander in the Royal Navy at the same time, the name may well refer to that unfortunate maiden. As a female name it also crops up in Shakespeare’s “Much ado about nothing”. One wonders if and when this name will ever return for female children?